Watch out, the Oak is in town! 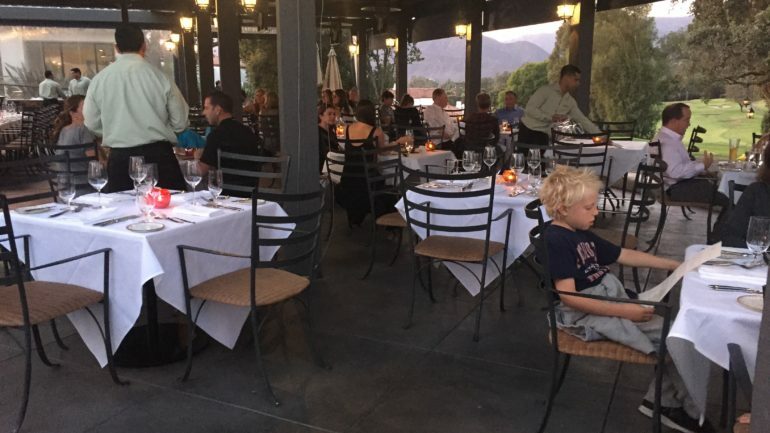 When we went on a recent vacation to Ojai we ate at a restaurant called the Oak which is located at the Ojai Valley Inn. I think they named it the Oak restaurant because they have big oak trees all around and there was even one right in perfect view from the restaurant with lots of lights hanging off of it. I remember when we tried to do that to our tree at our old house. It didn’t work. Now I can see how nice that would have been. Also in view from the restaurant are the 10th and 13th holes of a golf course. Sometimes I go with my dad when he plays golf. My favorite parts about going golfing with my dad are updating the little screen at the front of the cart where you can mark the score and, of course, when the hospitality cart comes around. One time when me and my brother went golfing with my dad we each had 3 Arnold Palmers! Arnold Palmer was a golfer who literally just recently passed away. And there is a drink named after him which is half iced tea and half lemonade. But this little talk about food gets me back to the Oak, and about what happened there. The Oak had been informed that I was coming, and it felt like they did everything except sing the National Anthem to make sure I was happy. They had even arranged for the chef to come out and meet me, which most restaurants do not do. So I was ready for an exciting first night in Ojai. When walked to the outside patio it was quite cold, and I had forgotten to bring a sweatshirt. But they had a heater right where we sat so that solved the problem. The evening started when they brought out gluten free bread. One thing you should know about me and eating is that I am an aggressive eater. I persuade others to give food. I trick people into making unfair trades. I am just joking. Sort of. I do try to get most of the good stuff though. So my brother and I were challenging each other of who could get and eat more bread. As soon as our server put the bread down, we pounced. And it really was that good. My mom had to cut us off because she didn’t think we would eat our dinner. 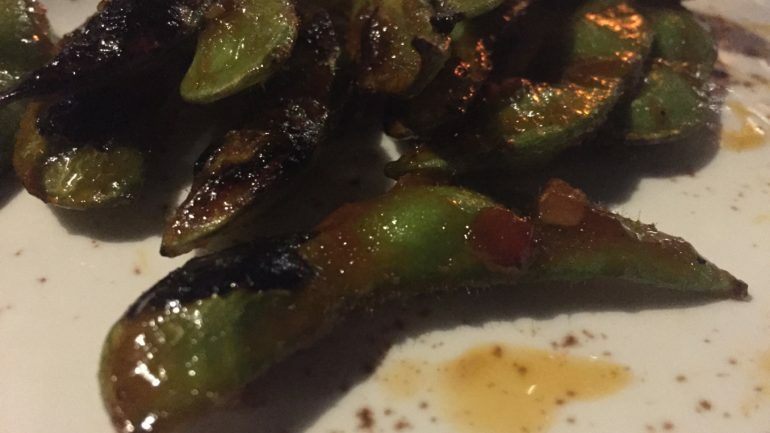 For an appetizer, my dad and Henry ordered something on the menu called blistered edamame. They thought it was fantastic and got me to try some. I’m not normally an edamame fan but I have to admit these were really good (and messy). I chomped quite a few bites down. They were made with garlic, chili and lime and had that kick that I like. Then they sent the chef out to talk to me. His name was Jayson. He told me he had just joined the restaurant as chef and he believed in making sure everyone who came was more than satisfied. He also brought out an appetizer from the kitchen with him: a little platter with roasted beets and watermelon. I tried this too and thought it was pretty tasty. My mom really enjoyed it. 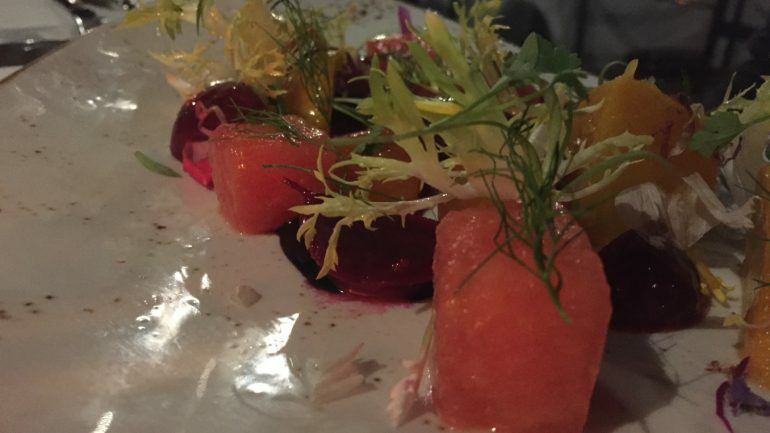 I thought if all three of these dishes – the bread, edamame, and the beet and watermelon platter – were this good then I couldn’t imagine how the main dish would be. 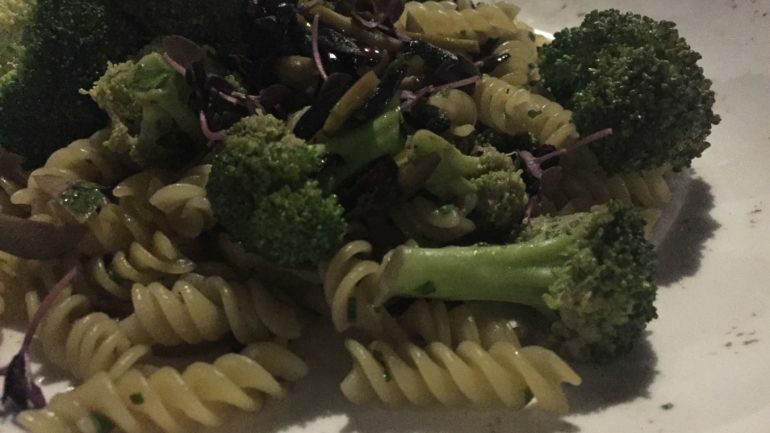 I had ordered pasta with olives and broccoli in an olive oil and garlic sauce, my usual favorite pasta dish. The only thing about this pasta was the olives were in smaller pieces then I am used to having. Just about every restaurant I have ordered this dish out (and there are many of them!) puts olives in whole or maybe cut in half. These were diced up so small! I actually discovered that I like it better because you get more of the olive flavor than you get when they are in bigger pieces. It feels like it spread out more through the dish. There was a lot more pasta than usual too in the dish. I at my entire plate though – and even some of my little brother’s when he got full. I wasn’t going to leave any of that laying around uneaten! 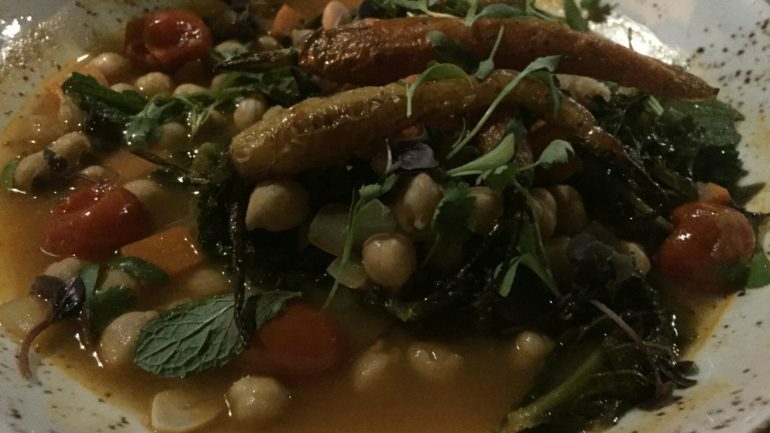 My mom had a Braised Chickpeas which was like a light chickpea stew with kale and carrots and my dad had a dish with lots of roasted vegetables called Roasted Brassicas. 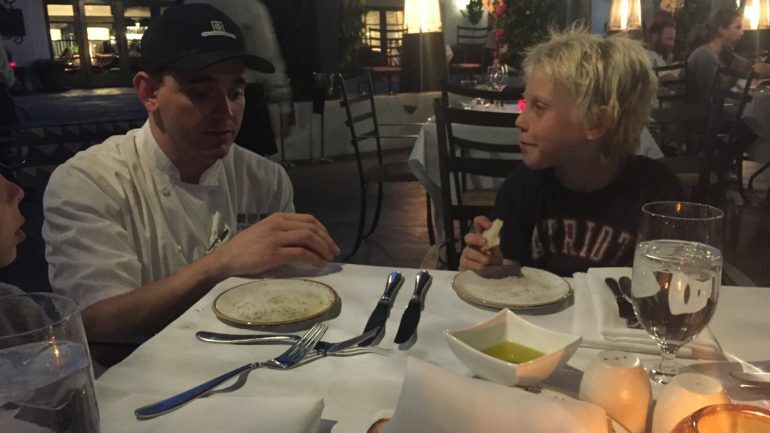 They both thought their dishes had a lot of flavor. 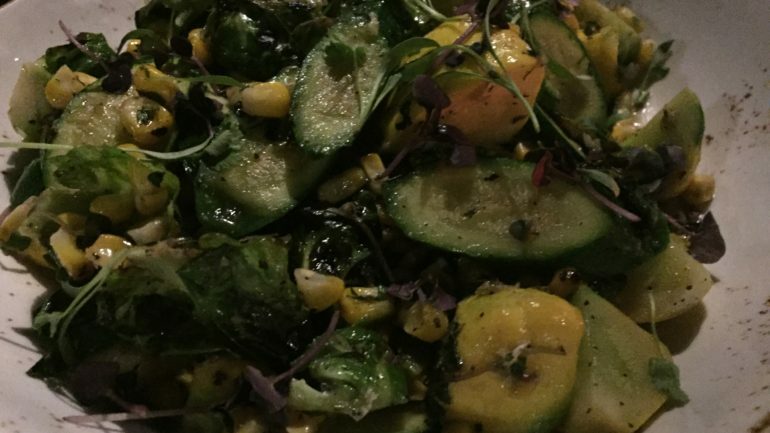 Every one of our main dishes was so scrumptious and combined with the view, I was super happy. My first night in Ojai was kicked off by visiting the Oak, and my trip could not have started better! I knew Ojai was a beautiful place to go with the mountains all around you and the old oak trees and the main street which has neat shops. But for me there has to be good food. And here, I found it all! 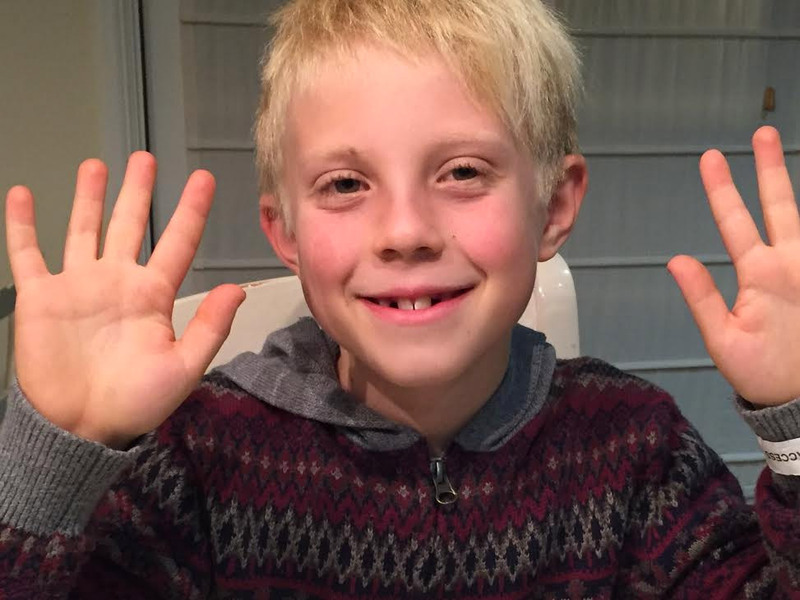 Max, sounds like a great meal! When I was a kid, I was the only “kid foodie” in town. I’m glad to see so many kids interested in food and cooking now. My late father so enjoyed seeing kids enjoy food, yours would probably be the only blog he would read! All the best to you. Thank you! What a nice comment to get. I do love to eat!